The aim of any translation project is the final version, that is, the translated document, cleaned of any source text elements. You can make a clean or final version at any time, even if you have translated the text only partially. Before you make the definitive final version, you are advised to execute the navigation command: Go to next translation unit to be translated/revised. If no translation unit is opened and if you get the message that no TU was found which does not meet the formal requirements set, you can be quite sure that the translation is okay from a formal point of view. 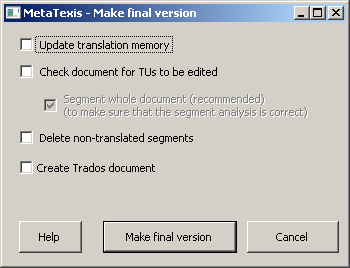 If this checkbox is checked, all translated segments of the document will be saved in the main TM before the final version is created. This way, you can make sure that your translation memory is up-to-date. If this checkbox is checked, the document will be checked for TUs that still need to be edited for formal reasons (similar to the go-to functions). If this checkbox is checked, the document will be segmented before the TU check is executed. This way, you can make sure that you have actually translated all relevant segments which need to be translated. 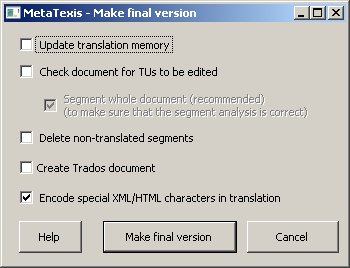 If this checkbox is checked, not only a final version will be produced, but also a traditional TRADOS-Word document (not a TagEditor document) containing both the source text and the translation. This can be very helpful when your customers require a traditional TRADOS-Word document, and not only the final version. This checkbox is only visible when you are translating HTML or XML documents (or other tagged documents, where applicable). If you activate this checkbox, characters like "<", ">", or "&" in the translation will be converted to HTML/XML code, so that they are correctly shown in the browser. Usually this checkbox should be checked. However, if you have added formatting tags in the translation without assigning the internal tag style, do not activate this checkbox. If you are not sure which setting is correct, try both options and view the result in the browser (a browser cannot only be used to view HTML, but also XML files, though you first might have to change the extension to "xml" if it is different).